The truth will set the Dutch free. I’m in Holland. It’s very cold and I’m staying with the in-laws. Worse than that I have no purpose. In Italy we were on holiday. Here we are “catching up” with family. There is only so much catching up that I can do. At a certain point I am all caught out. Unfortunately that point tends to arrive more quickly than I originally gave credit for when I booked my return flight back home. So we are keeping ourselves as busy as possible while drinking lots of tea, eating lots of bread, and having lots of discussions. One thing I like about the Dutch is that they say it like it is. Or rather, they say it as they see it. I’ve had some good discussions in the last few days and I’ve been surprised at the openness with which my ideas and thoughts on current topics have been accepted. Yes, my resolution not to talk about politics is out the window, but that was only ever for the Italians who need to live in a world of semi-fantasy in order to survive. The Dutch are different. Of course, this isn’t all happiness and light. One thing that the Dutch do is to have an opinion on everything, no matter how much information they have at hand. So if they hear of a situation and are privy to 5% of what happened they will then form an opinion based on as if they held 100% of the facts. This tends to be a bit annoying but the positive aspect is that if you give them more information on the topic they are then usually quite happy to change their position on the matter, which they will then hold with a rigid ferocity as before. But nobody has got upset with me. I say that I admire Geert Wilders and I hope he wins. In Australia this would result in people telling me that I am a bad person. The Italians would fly off the handle while wringing their hands in the air and telling me that I am a lunatic. But here in Holland they simply look at me in a curious manner and then ask me why I hold that opinion. And then I explain my reasoning. And then they examine the new information and add it to their own information bank. I’ve had a number of conversions already. I am not proclaiming that I speak the truth and that I know all, I am simply expressing my position on a subject and backing it up with logic, facts, and my own interpretation of the available information. What has most impressed me has been the absence of emotion when discussing these matters. That doesn’t mean that they are not capable of excitability, however. Yesterday I had a discussion with some family members about Trump. They were of the opinion that he will be a terrible president because he is not a “nice person.” Apparently Obama is great because he is nice. This did not go down too well at all. Some of them were in fact quite angry. But not with me – with the reality that I had presented them. We then got to talking about the media and what they present in newspapers and television. After a good deal of back and forth they finally accepted that perhaps the media is not involved in the business of truth. Wilders is someone who is involved in the business of truth, but the truth as he sees it. I said that I always attempt to find out my own truth based on many information sources. They agreed that this was an important effort to make. The point is that I could not have this discussion in Australia with the average person on the street. There would be a sharp intake of breath as my interlocutor realized the gravity of the situation at hand – they were in the presence of one of “those people”. The next step would be to place me in the basket of ‘racist’ or ‘misogynist’ or one of the many other usual labels. And finally I would be cast aside as the ‘bad person’ who was to be avoided. The Dutch tend not to do this. I haven’t swung everyone over to my side of the fence on these discussions, but we have always parted with the mutual satisfaction that both parties had set forth their arguments in a good manner and we had done our very best to reach a collective agreement but unfortunately that had not been possible at this time. Perhaps in the future. The Dutch are seekers of truth. They just need to have some more information at hand. Hopefully there will soon be more people to give it to them. Well! Y’know, when I was (much) younger, I tended to think that all Dutch people were blunt, arrogant, and rude and overbearing buggers. With the passing of the years, and a certain amount of the getting of wisdom (well, sort of; LOL) I realised that only one of those epithets applied – that of being blunt. AND … that’s a seriously good thing, especially when there’s a need to discuss the FACTS, not the PC-cleansed version of some other imbecile’s ideology! PS: enjoy your holiday! I’m jealous. lol, I know that feeling all too well! 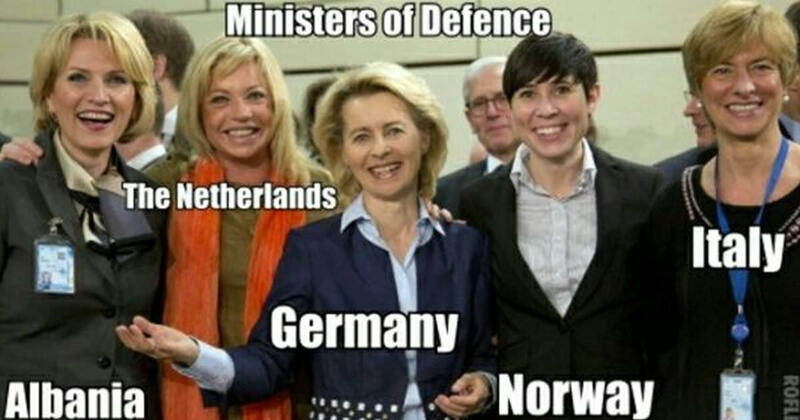 I like the defense ministers photo, I wonder what ‘Mad Dog’ is going to make of that lot come the next NATO conference.